Requests to retrieve user credentials can fail when a user has not yet saved credentials or when a user has not yet signed up to your app. In these situations, use the Credentials API to retrieve sign-in hints, such as the user's name and email address. Use these hints to pre-fill your app's sign-in and sign-up forms, speeding up your app's on-boarding process. On Android 6.0 (Marshmallow) and newer, your app does not need to request any device or runtime permissions to retrieve sign-in hints with the Credentials API. Configure an Android Studio project. To retrieve the sign-in hints, first configure the hint selector dialog by creating a HintRequest object. Then, pass the HintRequest object to CredentialsClient.getHintPickerIntent() to get an intent to prompt the user to choose an email address. Finally, start the intent with startIntentSenderForResult(). The user is prompted to choose an email address to use. Then, in the activity's onActivityResult() method, retrieve the hints from the Credential.EXTRA_KEY parcel, check whether the user is in your user database, and start the appropriate activity with the credentials hint. // Check for the user ID in your user database. If the user is in your user database and you started your app's sign-in activity, you can (optionally) check if the Credential object contains an ID token. If so, you can sign in the user with the ID token, without requiring the user to type a password. If the Credential object doesn't contain an ID token (or you don't want to use the ID token), pre-fill the sign-in fields with the hints that you added to the intent. 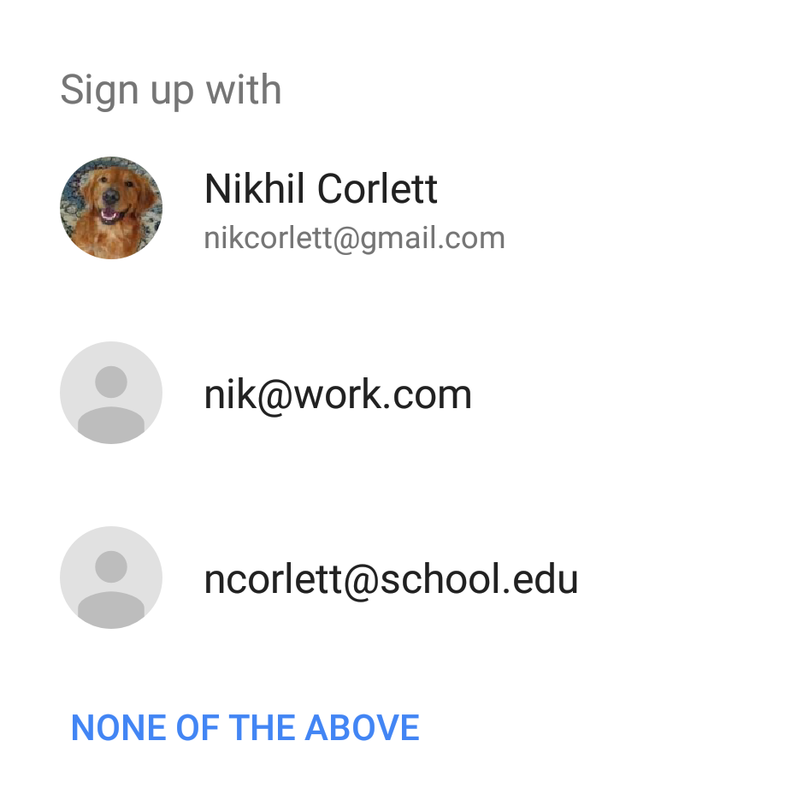 If the user isn't in your user database and you started your app's sign-up activity, pre-fill the sign-up fields with the sign-in hints that you added to the intent. mDisplaynameView.setText(credential.getName()); // Might be null. Optionally, you can also check if the Credential object contains an ID token that has a verified email address. If so, you can skip your app's email verification step, since the email address has already been verified by Google.